The reader is indebted to the author for his efforts in compiling this book. The facts presented are compelling and even more information would be welcomed. It is noted that as you move through the book, and through America’s history, the references to God become fewer and less direct. As someone who has not been to Washington D.C., I was not distracted from the content of the book by the “walking tour” design. The history and clear quotes of men such as Thomas Jefferson, Abraham Lincoln, and Franklin D. Roosevelt show the beliefs these men publically showed. 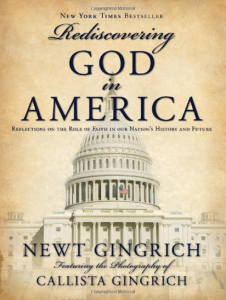 While this book demonstrates the clear history of a nation formed and developed from a viewpoint “under God,” it is not necessarily clear on how Christian that view has been. This short book can be read in a couple of hours, but the content and the quotes do not fail to provide fuel for thought and discussion.